Seeing the horror stories about people scratching up the screens of their Nintendo Switch consoles, I knew I needed to find a high quality screen protector. Recently I picked up a 7-in-1 starter kit from Speedlink that contained not only the needed screen protector, but also a few goodies I didn’t know I needed. Let’s take a look inside. 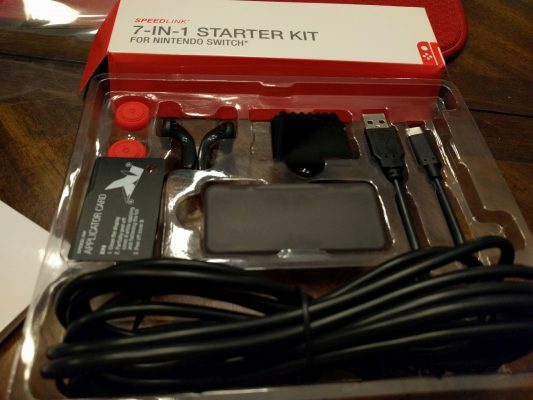 The plastic clamshell for this kit contains seven items (if the “7-in-1” part didn’t clue you in) — a charging cable, a screen cleaning cloth, two sets of silicone analog stick caps (two red, two black, so you can mix and match if you are crazy like that), a pair of 3.5mm headphones with a microphone built in, and the aforementioned screen protector with a self-described squeegee to apply it. The Speedlink team wanted to ensure you could charge and play, so they’ve included a nearly 10 foot cable. Combined with a USB car charger (sold separately), the Switch becomes the perfect car ride accessory. The USB-C cable is capable of charging the system as fast as you might drain it with a game like The Legend of Zelda: Breath of the Wild, but much of that is dependent on the power source behind it. Plugging it into a USB 1.0 or 2.0 port provides about 2.5 watts of power, but a USB 3.1 port is capable of a whopping 100 watts of power — more than enough to even power a laptop. Rapid charge indeed. In practice, I found that my car’s cigarette lighter port was more than capable of keeping my Switch going for the duration of some long trips, and some longer plane rides were more tolerable thanks to the lower powered in-seat USB port. The extra cable length is just long enough to be useful without being cumbersome. Speedlink found the right balance here. Everything you’ll need for your new console. Unless you are one of those people who insist on blaring your game while waiting in queue, you’ll probably want a pair of headphones or earbuds of some sort. Speedlink has tossed in a pair of black 3.5mm headphones with a built in microphone. They are unremarkable, but certainly serviceable. If you just need a pair of headphones to keep your game noise to yourself, these will do the trick. The silicon analog stick caps (hereafter called “nubs”) were an unexpected surprise. The Nintendo Switch has analog stick pairs with a small set of raised dashes in the up, down, left, and right directions, but there’s little in the way of real ‘traction’ on them. Worse yet, they are already small, convex, lack any sort of texture to them. It’s not a huge deal currently, but when Mario Kart 8 Deluxe or Ultra Street Fighter II: The Final Challengers are released, having a good grip will be paramount. In the meantime, they make games like Super Bomberman R’s frantic gameplay fairly easy. As there are two pair of nubs, you can even amp that up to four players without needing to buy another box. The nubs were a welcome surprise. There’s a better than likely chance you will want to take a few games with you when you are on the go. Rather than dropping your precious carts in your pocket where they could get damaged or stuffed with pocket lint, the starter kit also comes with a small plastic box that can hold four carts without being obtrusive. It was nice for my recent plane ride. The primary motivation for picking this up, the screen protector, was my only real disappointment in this package. I applied the protector several times to try to correct it, but unfortunately there appears to be a flaw in my kit, leaving a bubble with a small fleck of something embedded in it. I cleaned the screen and protector carefully, but no matter what I did I couldn’t clear the one last bubble. It’s about 2mm in size, and it’s at the bottom of my screen, but it’s there. The “squeegee” included is actually a semi-flexible card that helped with the few bubbles that inevitably occur when laying on a screen protector. I would normally use the edge of a credit card, so it was nice to have a purpose-built implement for the task. In this case, I couldn’t get the squeegee to push this flawed bubble, nor could I do it with the solid edge of a card. Without swapping it out, that flaw is here to stay. The bubble on the lower part of the screen will not die. The last goodie in the box is a screen cleaning cloth. Not unlike the type you’d get with a pair of glasses, it’s soft enough to ensure there’s no scratching of the screen and it cleans very effectively with just a few swipes. There’s little more to say about it other than the fact that it’s black, which is always fashionable. The Nintendo Switch is a fantastic new console, but a tiny scratch can ruin the fun. Speedlink has a great set of starter gear that hits most of the marks in one easy package. While I think I was just unlucky on my screen protector, the rest of the package is a solid addition to your new semi-handheld.